WHAT IS KETO CAST IRON MEATLOAF? Cast iron meatloaf is exactly what it sounds like. 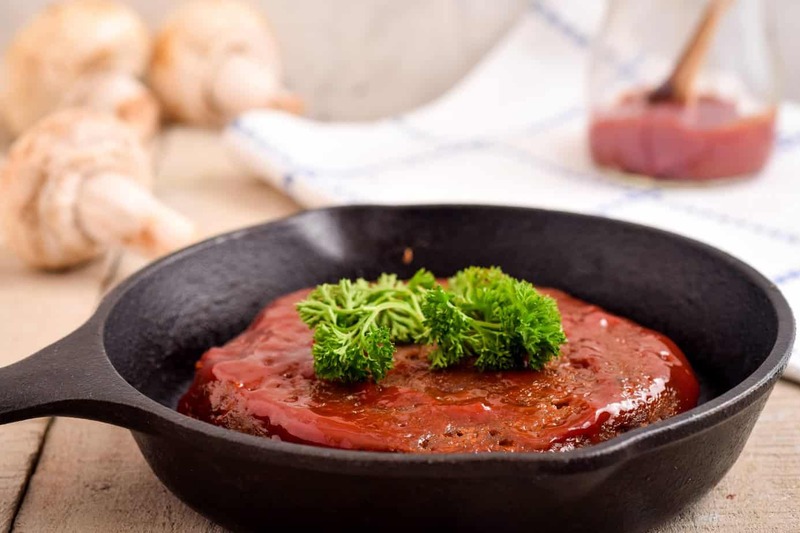 It is meatloaf that is cooked in a cast iron skillet instead of a traditional loaf pan. Because of this, the meatloaf is flatter and more “pie like,” all while retaining its delicious flavor. Traditional meatloaf recipes also call for the use of breadcrumbs, which adds to their carbohydrate content. This meatloaf, however, uses pork rind breadcrumbs, which give the meatloaf a delicious flavor. While this keto cast iron meatloaf is more dense than traditional recipes (mainly due to the lack of egg and breadcrumbs) but will be just as satisfying. And, it will cook faster thanks to its flatter, thinner shape. In order to make this meatloaf, you’ll need to make sure you have the following ingredients on hand first. After you’ve got these ready to go, you can start making meatloaf! Don’t forget to follow the link above to learn about making your own pork rind breadcrumbs. Begin by preheating your oven to 350˚F. Next, combine all meatloaf ingredients together in a large mixing bowl. Mix well with your hands (gotta get dirty!). Spread the mixture evenly into the bottom of a 10″ cast iron skillet; place into the oven. Cook for 45 minutes or until meatloaf is browned and done inside. While the meatloaf is cooking, mix the two topping ingredients together. Spread the topping on and place back into the oven for 5 minutes. Traditional meatloaf is not low-carb. As we mentioned above, traditional meatloaf recipes usually call for breadcrumbs (at the very least), if not more carb-filled ingredients. However, this meatloaf is low-carb and keto all the way! All it takes is a few ingredient tweaks to make it happen. Of course it can! We actually think meatloaf is one of the easiest dishes to freeze, as it can be thawed and reheated at a later date for another perfect meal. To freeze meatloaf, let the meatloaf cool on your countertop. Wrap it tightly in several layers of aluminum foil and place into a freezer Ziploc bag. Place the bag into the freezer. The meatloaf can safely stay in the freezer for at least a month. As the meatloaf approaches the two month mark, you’re going to want to reheat and eat it. Otherwise, it will more than likely start to freezer burn around the two month timeframe. At that point, it will be no good and you’ll have to discard it. Writing the date of freeze on the bag is a great way to help you keep track of how long is left. Storing your meatloaf is actually an incredibly easy task. It can be stored in any number of ways, each of which is quick and easy. For starters, you can slice the meatloaf and place into air-tight storage containers. That way, you can take it for lunch or simply pop it into the refrigerator for storage. You can also let the meatloaf and skillet cool down and cover in aluminum foil. Then, place the entire skillet into the fridge. Remove and uncover before reheating. More than likely, you’d want to use the stove method to reheat it if you store it this way. Keto meatloaf is super easy to reheat and eat. Leftovers taste just as good (if not better) the next day after the time spices and ingredients have had time to meld together even more. Unlike most meat dishes, meatloaf actually will reheat well in the microwave. It doesn’t make the meat tougher and will heat it quickly and efficiently. If you’re planning to reheat your meatloaf in the microwave, heat in one minute increments until heated through. Voila! Easy and simple. If you’d like to heat your meatloaf more slowly, you can use your oven. It will give you a deliciously warm meatloaf and keep it buttery tender at the same time. Preheat your oven to 350˚F and place your meatloaf onto an oven-safe baking sheet. Heat for 10 minutes, then check for desired temperature. If the meatloaf isn’t heated through yet, continue to heat in the oven in four minute increments until the desired level of temperature is reached. If you’ve never had grilled meatloaf before, you are truly missing out. Having said that, a grill is a great way to reheat your leftover meatloaf. Slice the leftover meatloaf (if its not already) and place it onto your grill. Grill until both sides have nice grill marks. You can also use any other reference point for what you think is “done” when using a grill. WHAT GOES GREAT WITH MEATLOAF? There are tons of great recipes to pair with your cast iron skillet meatloaf. A great mixed drink, dessert, or side dish all go perfectly with this recipe. 10″ Cast Iron Skillet – Cast iron cookware is some of the most versatile yet durable cookware on the planet. A cast iron skillet provides more depth than comparable cookware, allowing for plenty of room to stir and cook. Ten inches is a great size, too, and is the size we recommend in a lot of our recipes that utilize cast iron cookware. If you don’t have a piece of cast iron, why not invest in one?